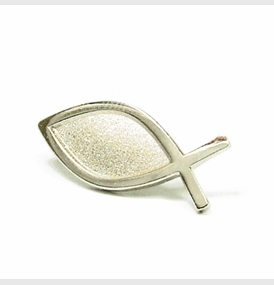 High quality Christian Jewelry, in the form of a Silver Christian Fish Lapel Pin with a push on butterfly clasp. The finish is matte bordered with shiny trim. Dimensions are .8" long by .35" tall. These are really great conversation starters and a definite way to advance the kingdom. Bonus, super cute too.